The study mainly aimed to identify an important task of adolescence, i.e. romantic relationships by investigating possible roles of socio-economic status of families, attachment dimensions, future orientation and perceived abuse in relations on relationship satisfaction of female university students. Moreover, it is aimed to understand the role of being a student of state or private universities, as well as grades, relationship durations, family income, mothers’ and fathers’ education level and marital status of parents’ among perceived abuse in relationship and satisfaction in relationship. 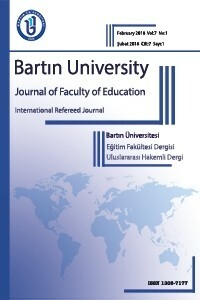 To that end, we carried out the research in two different universities whose students have different socio-economic background with the assumption that it has an important role in perceiving abuse as well as in determining the value of romantic relationship.According to findings, students of the private university have more satisfaction in their romantic relationships than students of the state university. Females who are at higher-grades and have relatively longer relationship also have more relationship satisfaction. Besides, according to findings of regression analysis, predictive factors of romantic relationship satisfaction are avoidance attachment, perceived abuse in romantic relationship, anxiety attachment and future time orientation in romantic relationship. Price, E. L., Byers, E. S., & the Dating Violence Research Team (1999). The Attitudes Towards Dating Violence Scales: Development and initial validation. Journal of Family Violence, 14, 351-375. Russell-Chapin, L.A., Chapin, T.J. & Sattler, L.G. (2001). The Relationship of Conflict Resolution Styles and Certain Marital Satisfaction Factors to Marital Distress. The Family Journal: Counseling and Therapy for Couples and Families, 9(3), 259-264. Sabatelli, R.M. (1988). Exploring relationship satisfaction: a social exchange perspective on the interdependence between theory, research and practice. Family Relations, 37(2), 217-222. Saltzman, L. E., Fanslow, J. L., McMahon, P. M., & Shelley, G. A. (2002). Intimate partner violence surveillance: Uniform definitions and recommended data elements, version 1.0. Atlanta, GA: Centers for Disease Control and Prevention, National Center for Injury Prevention and Control. Saraç, A., Hamamcı, Z. & Güçray, S. (2015). Üniversite Öğrencilerinin Romantik İlişki Doyumunu Yordaması. Türk Psikolojik Danışma ve Rehberlik Dergisi, 5(43), 69-81. Schweitzer, R. D. (1996). Problems and awareness of support services among students at an urban Australian university. Journal of American College Health, 45 (2), 73-77. Selçuk, E., Gunaydin, G., Sumer, N. & Uysal A. (2005). Yetişkin bağlanma boyutları için yeni bir ölçüm: Yakın İlişkilerde Yaşantılar Envanteri-II’nin Türk örnekleminde psikometrik açıdan değerlendirilmesi. Türk Psikoloji Yazıları, 8, 1-11. Shorey, R.C., Cornelius, T.L. & Bell, K.M. (2008). A critical review of theoretical frameworks for dating violence: Comparing the dating and marital fields. Aggression and Violent Behavior, 13, 185–194. Simpson, J. A. (1990). The influence of attachment styles on romantic relationships. Journal of Personality and Social Psychology, 59, 971-980. Steinberg, L. (2007). Ergenlik (F.Çok, Trans.). Ankara: İmge (Original work published 1985).